The drinking water resources on the eastern, Jordanian side of the Dead Sea could decline more severely as a result of climate change than those on the western, Israeli and Palestinian side. 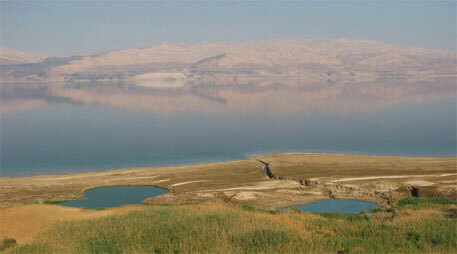 This is the conclusion reached by an international team of researchers that calculated the water flows around the Dead Sea. The natural replenishment rate of groundwater near the salt lake will reduce dramatically in the future if precipitation lowers as predicted, says the research that was published in journal Science of the Total Environment. The lowest lake on earth is not only one of the biggest tourist attractions in West Asia but more than four million people rely on the groundwater resources in its catchment basin. But the water level of the Dead Sea has been falling by around a metre per year as majority of its tributaries have been dammed so that their water can be captured well before flowing into the salt lake. With the decreasing water in the lake, the surrounding groundwater levels are also plummeting. According to the study, even now the available groundwater resources in the region are not sufficient to meet the growing water requirements of the population and agriculture. If the situation worsens, it could have serious social, economic and ecological consequences for the region. For a long time, the complex hydrology of this region presented major unknown factors in the local water balance equation. For the first time, researchers were able to work out—on an international scale— how much water actually infiltrates from rainfall and replenishes the groundwater reservoir: around 281 million cubic metre per year. The research will help look into at environmental risks, water availability and climate change as a whole, so as to develop solutions for this unique region. This, in turn, will not only enable people to continue to visit the biblical sites, but also enable the people of this region to continue living there. The study, founded by Germany, was initially conducted within the framework of the multilateral Integrated Water Resources Management (IWRM) project SUMAR. Since completion of the project, the research has been continued by various branches of Helmholtz Centre for Environmental Research. Can the Red Sea raise the Dead Sea? Climate change may be sparking new and bigger "dead zones"